Yet these theories have been empirically invalidated time and again in well-publicized, peer-reviewed studies. Their continued usage represents another calibration error—between the claimed precision of the models and the actual unpredictability of markets. The intellectual foundations of modern finance lie in John Burr Williams’s 1937 Harvard dissertation-turned-book, The Theory of Investment Value (Harvard University Press, 1938), and in this ambitious man’s attempt to use scientific thinking to end the wild volatility of markets that had wreaked havoc on the country during the Great Depression. Like many in his day, Williams believed in the promise of technocratic governance, that the world’s problems could be solved by men of solid intellect meeting in wood-paneled rooms to weigh in on matters of urgency for society. The dividend discount model, and the application of The Theory of Investment Value, had a simple purpose: making the excess volatility of markets disappear by putting experts in charge of setting prices. In addition to making investing a far less exciting practice, Williams believed this new expert-based approach would result in “fairer, steadier prices for the investing public.” These experts needed only his formulas. With this logarithmic model for growth (the familiar “S-curve” that Bain & Company consultants so dearly love) and a few additional formulas to provide the “terminal value” once competitive forces had stalled growth, Williams believed the true value of a company could be determined. Combining a company’s budget with these new algebraic formulas offered an approach that Williams believed was “altogether new to the accountant’s art.” Williams grew almost giddy with excitement contemplating the beauty of his new technique. “By the manipulation of algebraic symbols, the warp of development is traced through the woof of time with an ease unknown to ordinary accounting.”9 One can only imagine what literary metaphors might decorate Williams’s prose had he lived to see the modern Excel model! But the generation of finance researchers emerging after World War II was more optimistic. The success of American industry—and American science—in defeating the Nazis inspired confidence in a new generation of researchers who believed that better math and planning could change the course of human affairs. Harry Markowitz was one of these men. Born in 1927, a teenager during the war, he studied economics at the University of Chicago in the late 1940s. After Chicago, Markowitz researched the application of statistics and mathematics to economics and business first at the Cowles Commission and then at the RAND Corporation. He was at the epicenter of the new wave of technocratic, military-scientific planning institutes. Markowitz’s explanation for why diversification was both observed and sensible was that investors care about both returns and about “variance.” By mixing together different securities with similar expected returns, investors could reduce variance while still achieving the desired return. Investors, he believed, were constantly balancing expected returns with expected variance in building their portfolios. The logical next step in this argument was that the prices of different assets should have a linear relationship to their expected variance to maintain a market equilibrium where one could only obtain a higher return by taking on a higher amount of variance. This was the logic of the Capital Asset Pricing Model developed by Markowitz’s student William Sharpe. Sharpe’s Capital Asset Pricing Model was meant as “a market equilibrium theory of asset prices under conditions of risk.”16 He believed that “only the responsiveness of an asset’s rate of return to the level of economic activity is relevant in assessing its risk. Prices will adjust until there is a linear relationship between the magnitude of such responsiveness and expected returns.”17 Sharpe measured responsiveness by looking at each security’s historical variance relative to the market, which he labeled its beta. Alas, it would be another forty years before the notion of state planning by experts generally fell out of fashion and Hayek was given the Nobel Prize for his 1940s era work on price discovery in the broader field of economics. It is enough to note for our purposes that in financial economics many of the hangovers of the Williams/Markowitz/Sharpe era, and its religious faith in algebraic calculations and experts’ forecasting power, lasted well beyond the nightmare of the 1970s. The intellectual history of modern finance theory thus followed a simple logical flow. A stock is worth the net present value of future dividends. But investors must not only care about expected return—otherwise they would put all their money in one stock—they must also care about the variance of their investment portfolios. If investors want to maximize expected return and minimize expected variance, then expected variance should have a linear relationship with expected return. This is the core idea: combining a forecast of future cash flows with an assessment of future variance based on the historical standard deviation of a security’s price relative to the market should produce an “equilibrium” asset price. Williams, Markowitz, and Sharpe were all brilliant men, and their models have a certain mathematical elegance. But there is one big problem with their theoretical work: their models don’t work. The accumulated empirical evidence has invalidated nearly every conclusion they present. Below is a graph showing the actual future value of earnings discounted back at the actual interest rates relative to the actual stock market index over time. As you can see, the stock market index is far more volatile than could possibly be explained through the dividend discount model. Future earnings and interest rates do not explain stock price movements as Williams thought they would. 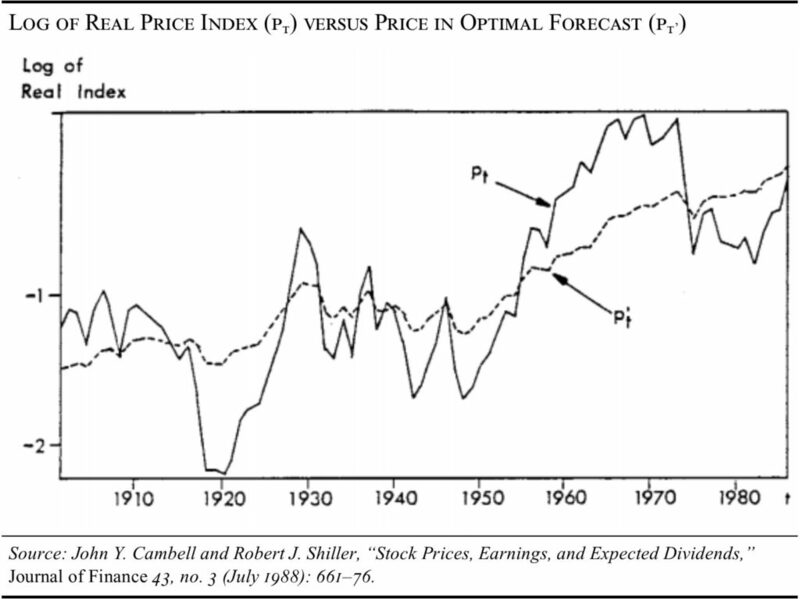 Variance also fails to explain stock prices, as Markowitz and Sharpe thought they would. 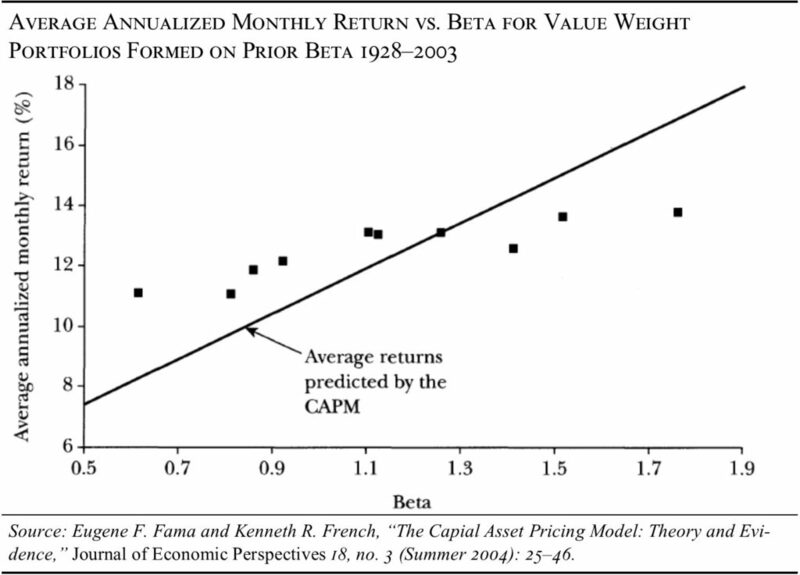 In a review of forty years of evidence, Nobel Prize winner Eugene Fama and his research partner Ken French declared in 2004 that the Capital Asset Pricing Model (CAPM) was bunk: “despite its seductive simplicity, the CAPM’s empirical problems probably invalidate its use in applications.”19 These models fail because they assume predictability: they assume that it is possible to forecast future dividends and future variance by using past data. The core prediction of the model—that stocks with higher price volatility should produce higher returns—has failed every empirical test since 1972. Below is a graph from Fama and French showing CAPM’s predictions relative to reality. So what is the alternative? A philosophy based on unpredictability. As we have seen time and time again, experts cannot predict the future. The psychologist Philip Tetlock ran a twenty-year-long study in which he picked 284 experts on politics and economics and asked them to assess the probability that various things would or would not come to pass.20 By the end of the study, in 2003, the experts had made 82,361 forecasts. They gave their forecasts in the form of three possible futures and were asked to rate the probability of each of the three. Tetlock found that assigning a 33 percent probability to each possible alternative future would have been more accurate than relying on the experts. Think back to 2016: The experts told us that Brexit would never happen. They told us that Trump would never win the Republican primary, much less the general election. In both cases, prominent academics and businessmen warned of terrible consequences for financial markets (consequences that, of course, never came to pass). These are only two glaring examples of the larger truth Tetlock has identified: experts are absolutely terrible when it comes to predicting the future. Stanford economist Mordecai Kurz argues that there are a variety of rational interpretations of historical data that lead to different logical predictions about the future (just think of all the different analysts and researchers currently putting out very well-researched and very well-informed predictions for the price of oil one year from now). But only one of those outcomes will come true, and when the probability of that one outcome goes from less than 100 percent to 100 percent, every other alternative history is foreclosed.21 Kurz has developed a model that explains 95 percent of market volatility by assuming that investors make rational forecasts that future events nevertheless prove incorrect. In his 1962 classic The Structure of Scientific Revolutions, historian of science Thomas Kuhn posited that scientists rely on simplified models, or paradigms, to understand the observed facts. These paradigms are used to guide scientific enquiry until such enquiry turns up facts that cast these paradigms into doubt. Scientific revolutions are then required to develop new paradigms to replace the old, disproven ones. 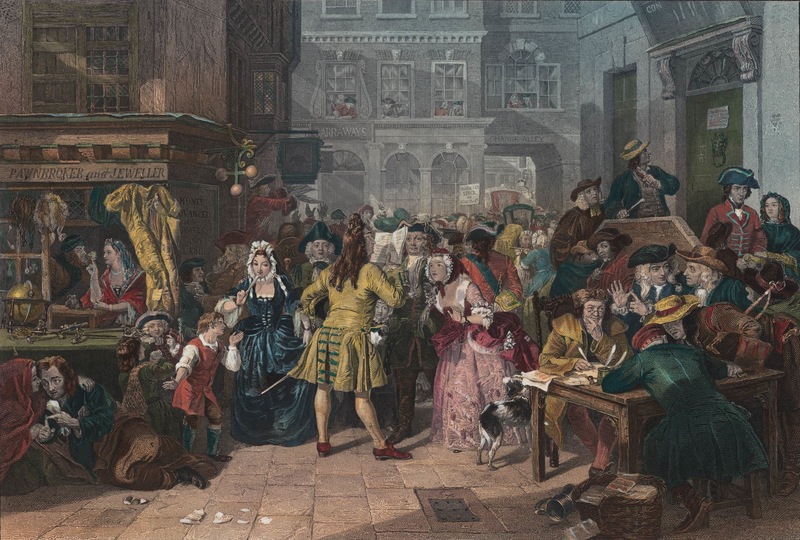 The economists Harrison Hong, Jeremy Stein, and Jialin Yu have posited that markets function in a similar way.22 Investors come up with simplified models to understand individual securities. When events unfold that suggest that these simple models are incorrect, investors are forced to revise their interpretation of historical data and develop new paradigms. Stock prices move dramatically to adjust to the new paradigm. Ever-changing paradigms are necessary because the world is infinitely complex, and forecasting would be impossible without simplification. Think of all of the many things that affect a stock’s price: central bank policy, fund flows, credit conditions, geopolitical events, oil prices, the cross-holdings of the stocks’ owners, future earnings, executive misbehavior, fraud, litigation, shifting consumer preferences, etc. No model of a stock’s price could ever capture these dynamics, and so most investors rely instead on dividend discount models married to investment paradigms (e.g., a growth investor who looks for companies whose growth is underpriced relative to the market combines a paradigm about predicting growth with a dividend discount model that compares the rate of that growth to what is priced into the stock). But both these dividend discount models and these investment paradigms are too simple and are thus frequently proven wrong. In direct contradiction to the capital asset pricing model, value stocks significantly outperform growth stocks.25 Large value stocks outperform large growth stocks by 0.26 percent per month controlling for CAPM, and small value stocks outperform small growth stocks by 0.78 percent per month controlling for CAPM. This is a significant and dramatic difference in return that stems entirely from betting on out-of-favor stocks that the experts dislike, and avoiding the glamorous, in-favor stocks that professional investors like. The man who would go on to become the youngest recipient of the Nobel Prize in economics, Kenneth Arrow, began his career during World War II in the Weather Division of the U.S. Army Air Force. The division was responsible for turning out long-range weather forecasts. Arrow ran an analysis of the forecasts and found that his group’s predictions failed to beat the null hypothesis of historical averages. He and his fellow officers submitted a series of memos to the commanding general suggesting that, in light of this finding, the group should be disbanded and the manpower reallocated. Finance professionals rely on discounted cash flow models and capital asset pricing assumptions not because they are correct but because they are required for planning purposes. These tools lend social power to the excellent sheep of American society, the conventionally smart but dull and unimaginative strivers: the lawyers of the baby-boom generation and the MBAs of the millennial era. These managerial capitalists are not trying to remake the world. They are neither craftsmen, pursuing a narrow discipline for the satisfaction of mastering a métier, nor are they entrepreneurs, pursuing bold ideas to satisfy a creative or competitive id. Rather, they are seeking to extract rents from “operating businesses” by taking on roles in private equity or “product management” where their prime value add will be the creation of multi-tab Excel models and beautifully formatted PowerPoint presentations. Ironically, these theories were invented to avoid bubbles, to replace the volatility of markets with the predictability of an academic discipline. But corporate America’s embrace of empirically disproven theories speaks instead to a hollowness at the core—the prioritization of planning over purpose, of professional advancement over craftsmanship, and rent-seeking over entrepreneurship. Harvard Business School and the Stanford Graduate School of Business are the Mecca and Medina of this new secular faith. The curriculum is divided between courses that flatter the vanity of the students (classes on leadership, life design, and interpersonal dynamics) and courses that promote empirically invalidated theories (everything with the word finance in the course title). Students can learn groupthink and central planning tools in one fell swoop. Indeed, the problem of the business schools is so clear that a few clever wags on Wall Street now use the “Harvard MBA Indicator” as a tool to detect bubbles. If more than 30 percent of Harvard MBAs take jobs in finance, it is an effective sell signal for stocks. Our capitalist economy offers every possible incentive for accuracy and the achievement of excellence. Why do people keep using bad theories that have failed in practice and have been academically invalidated? Not because these theories and methods produce better outcomes for society, but because they create better outcomes for the middle manager, creating a set of impenetrably complex models that mystify the common man and thus assure the value of the expert, of the MBA, of the two-years-at-an-investment-bank savant. Active investment management does not work for investors because it was not designed to benefit them: it was designed to benefit the managers. The last decade of sclerotic economic growth has shown that, in many cases, corporate management teams are not working to benefit the shareholders, the employees, or anyone other than themselves. 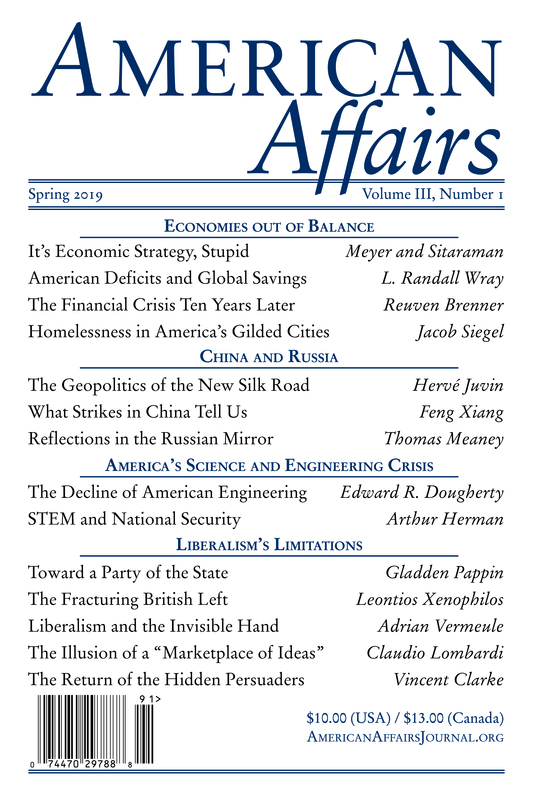 This article originally appeared in American Affairs Volume I, Number 2 (Summer 2017): 72–83. 1 Eugene F. Fama and Kenneth R. French, “Luck versus Skill in the Cross-Section of Mutual Fund Returns,” Journal of Finance 65, no. 5 (October 2010): 1915–47. 2 Andreas Hackethal, Michael Haliassos, and Tullio Jappelli, “Financial Advisors: A Case of Babysitters?,” Journal of Banking and Finance 36, no. 2 (February 2012): 509–24. 3 Tim Jenkinson, Howard Jones, and Jose Vicente Martinez, “Picking Winners? Investment Consultants’ Recommendations of Fund Managers,” Journal of Finance (forthcoming). 4 Russel Kinnel, “How Expense Ratios and Star Ratings Predict Success,” MorningStar, August 9, 2010. 5 John Burr Williams, The Theory of Investment Value (Cambridge: Harvard University Press: 1938), 191. 13 Harry Markowitz, “Portfolio Selection,” Journal of Finance 7, no. 1 (March 1952): 77. 16 William F. Sharpe, “Capital Asset Prices: A Theory of Market Equilibrium under Conditions of Risk,” Journal of Finance 19, no. 3 (Sept. 1964): 427. 18 F. A. Hayek, “The Present State of the Debate,” in The Collected Works of F. A. Hayek, vol. 10, Socialism and War: Essays, Documents, Reviews, ed. Bruce Caldwell (Chicago: University of Chicago Press, 1997), 110. 19 Eugene F. Fama and Kenneth R. French, “The Capital Asset Pricing Model: Theory and Evidence,” Journal of Economic Perspectives 18, no. 3 (Summer 2004): 44. 20 Philip E. Tetlock, Expert Political Judgment: How Good Is It? How Can We Know? (Princeton: Princeton University Press, 2005). 21 Mordecai Kurz, “On Rational Belief Equilibria,” Economic Theory 4 (1994): 859–76. 22 Harrison Hong, Jeremy C. Stein, and Jialin Yu, “Simple Forecasts and Paradigm Shifts,” Journal of Finance, 62, no. 3 (June 2007): 1207–42. 23 Rafael La Porta, Josef Lakonishok, Andrei Shleifer, and Robert Vishny, “Good News for Value Stocks: Further Evidence on Market Efficiency,” Journal of Finance 52, no. 2 (June 1997): 859–74. 24 “The Case for Low-Cost Index-Fund Investing,” Vanguard Research, April 2017, https://personal.vanguard.com/pdf/ISGIDX.pdf. 25 Eugene F. Fama and Kenneth R. French, “The Value Premium and CAPM,” Journal of Finance 61, no. 5 (October 2006): 2163–85. 26 Louis K. C. Chan, Jason Karceski, and Josef Lakonishok, “The Level and Persistence of Growth Rates,” Journal of Finance 58, no. 2 (April 2003). 27 Social Change and Public Decision Making: Essays in Honor of Kenneth J. Arrow, ed. Walter P. Heller, Ross M. Starr, and David A. Starrett, vol. 1 (Cambridge: Cambridge University Press, 1986), xiii.